WALLOPS ISLAND, Va. -- NASA's latest moon mission, a $280 million project to study the lunar atmosphere, soared to space aboard a Minotaur 5 rocket Friday in a brilliant late-night launch from Virginia that lit up skies all along the U.S. East Coast. The launch put the Lunar Atmosphere and Dust Environment Explorer in a near-perfect orbit stretching more than 170,000 miles from Earth at its farthest point, and the LADEE spacecraft successfully deployed from the Minotaur rocket about 23 minutes after an on-time liftoff from Wallops Island, Va., at 11:27 p.m. EDT Friday (0327 GMT Saturday). 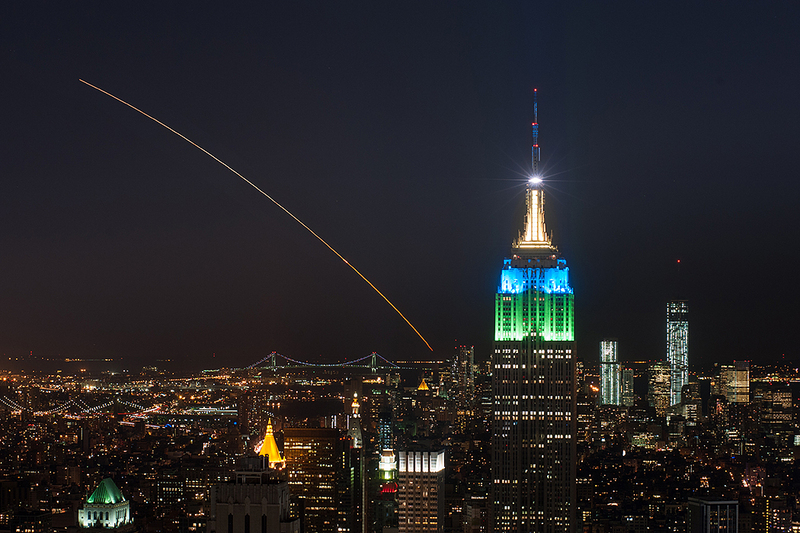 Observers from North Carolina to New Hampshire caught a glimpse of the stubby white launcher streaking into space on an easterly heading over the Atlantic Ocean. But the 844-pound moon probe ran into trouble moments after separating from the Minotaur's upper stage, when LADEE's on-board computer detected high electrical currents in the satellite's reaction wheels and shut them down. After scrambling to understand and fix the problem overnight, NASA announced Saturday afternoon the reaction wheels were back up and running. The spinning wheels generate momentum to keep LADEE pointed in the right direction. 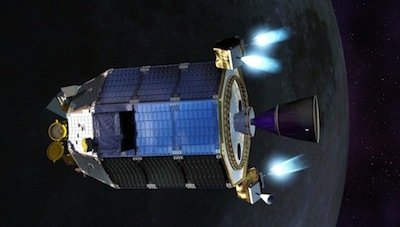 The probe uses thrusters and reaction wheels to control its orientation in space, but the miniature rocket engines burn precious propellant, and the six-month duration of LADEE's mission is already limited by the craft's fuel reserves. Officials said the mission's design allowed engineers several weeks to resolve the problem, but NASA announced Saturday afternoon the reaction wheels were reactivated and LADEE was in a stable pointing mode. "This was determined to be the result of fault protection limits put in place prior to launch to safeguard the reaction wheels," NASA said in a statement posted online. "The limits that caused the powering off of the wheels soon after activation were disabled, and reaction wheel fault protection has been selectively re-enabled." The spacecraft was otherwise healthy after Friday night's fiery launch. "Our engineers will determine the appropriate means of managing the reaction wheel fault protection program. Answers will be developed over time and will not hold up checkout activities," said Butler Hine, LADEE project manager at NASA's Ames Research Center in Moffett Field, Calif.
"Like any new venture, things don't always go quite as planned," said John Grunsfeld, NASA's associate administrator for science. Shaped like a bullet, standing 7.7 feet tall and stretching about 4.7 feet in diameter, LADEE's outer skin is covered in power-generating solar panels. That design feature, introduced to add to the mission's simplicity and resiliency, proved wise after the post-launch attitude control glitch. Other missions relying on deployable solar panels must be aimed at the sun to generate electricity, making a sudden loss of attitude control potentially fatal. LADEE was launched into an oval-shaped orbit extending more than 170,000 miles from Earth, and the mission's plan calls for the spacecraft to complete three circuits of the planet before it is captured by the moon's gravity and pulled away from Earth. The spacecraft will fire its main rocket engine in early October. The burn will brake the spacecraft into lunar orbit before it begins pursuing the mission's two objectives: test a high-tech laser communications package, and answer fundamental questions about the moon's atmosphere and dust. LADEE's first task at the moon will be the activation of a laser communications payload designed by MIT Lincoln Laboratory to wring out advanced technologies which could enable broadband data links with future missions traveling into the solar system. The month-long laser demo will link LADEE with ground terminals positioned in New Mexico, California and the Canary Islands. 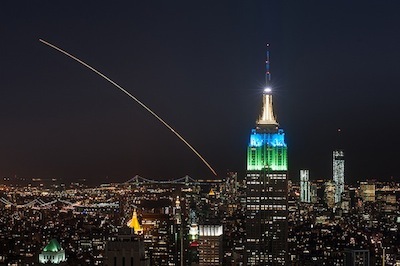 LADEE will try to send and receive data packets transmitted through a laser beam connecting the spacecraft and the ground terminals at a range of about 250,000 miles. "NASA has a need for faster download speeds for data from space," said Don Cornwell, manager of the laser communications payload. "We'd like to be able to send high-resolution images, and even movies in 3D, from satellites that not only orbit the Earth, but also from probes that will go to the moon and beyond." LADEE will begin the science phase of its mission at the conclusion of the laser communications testing. The small orbiter's instruments will scoop up dust particles, identify the chemical make-up of the moon's atmosphere, and look for signs of hydrated compounds, such as water and hydroxyl (OH), migrating from the moon's middle latitudes toward polar cold traps in permanent shadow, where scientists say ice can sit undisturbed for billions of years. The moon's atmosphere is not what many envision, Noble said. Its atoms never collide, an attribute which makes the lunar atmosphere an exosphere. The probe's instruments will try to find out what drives the tenuous atmosphere, its composition, and how new constituents are added from the lunar surface. LADEE will also observe dust particles streaming high above the moon's surface in a mysterious process scientists think is responsible for a predawn glow over the lunar horizon spotted in the 1960s by early robotic missions, then recounted by Apollo astronauts who sketched what they saw in journals. LADEE's mission started with a flash of orange light and a rapid, thunderous ascent into space from launch pad 0B at the Mid-Atlantic Regional Spaceport, a complex leased and operated by the Virginia Commercial Space Flight Authority. The launch pad lies on property owned by NASA's Wallops Flight Facility. The Minotaur 5 booster's first stage - a decommissioned motor from a Peacekeeper nuclear missile - shot the five-stage, 80-foot-tall launcher to an altitude of 76,000 feet in less than a minute, leaving a twisting gray smoke plume hovering over the marshlands of Virginia's Eastern Shore. Four more rocket motors fired in succession over the next 20 minutes to inject LADEE into the right orbit. It was the first flight of a Minotaur 5 rocket, which relies on flight-proven components from smaller boosters in the Minotaur family. 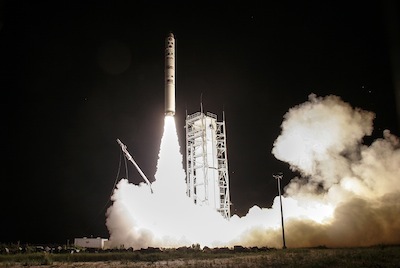 A quick look at data from the launch showed the Minotaur 5 performed flawlessly, according to Lou Amorosi, the rocket's program director at Orbital Sciences Corp., the Minotaur's prime contractor under an agreement with the U.S. Air Force, which manages the program. "The rocket itself did everything we asked of it, and it was a picture-perfect mission," said Air Force Col. Urban Gillespie, the Minotaur's mission director from the Space Development and Test Directorate at Kirtland Air Force Base, N.M.